After losing three straight games, two of which in overtime, the Blackhawks come home for a rare game in Chicago. The loss on Sunday came at the hands of the hottest team in the Eastern Conference. Monday night, the Hawks find themselves in a desperate situation against one of the hottest teams in the Western Conference, the San Jose Sharks. And while the Blackhawks have received a good year from Corey Crawford between the pipes, San Jose’s recent streak has been fueled by their goalie – Antti Niemi. Since the All Star Break, Corey Crawford’s numbers are deceptively above average. 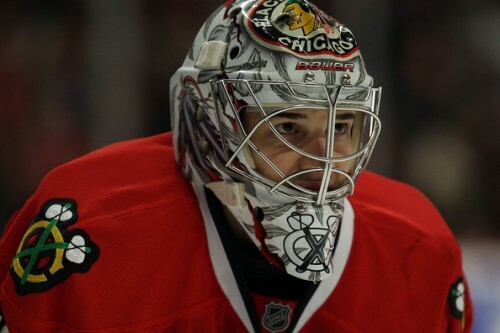 In 15 games, Crawford is 10-3-2 with a .914 save percentage and 2.39 goals against average. Perhaps the greatest testament to the Blackhawks accounting for Crawford coming back to Earth after are his numbers in March: even though he has a 3.40 goals against average and .871 save percentage, Crawford’s record is 3-1-1. On the other end of the spectrum, the Sharks have been winning games because of Niemi. In 19 games since the All Star Break, Niemi is 13-3-2 with a .928 save percentage and 1.95 goals against average. In March, Niemi has picked up his personal play, posting an outstanding 2.07 goals against average and a .913 save percentage. However, Niemi’s record is only 3-1-2 in March. It doesn’t help that both teams will be looking into their past, while focused on their present and future. For San Jose, their immediate past includes an exit from the 2010 postseason in four games to Niemi and the Blackhawks. When he signed a one-year deal with San Jose over the summer, Niemi was described by Sharks GM Doug Wilson as one of the key players on that Chicago roster. For Chicago, Niemi did what Tony Esposito and Ed Belfour, among others, couldn’t: win the Stanley Cup. But after an ugly summer of arbitration and confusing rhetoric, Niemi was gone and Crawford was the man. Overall this year, their numbers are fairly similar. Crawford has a chance to do what Niemi couldn’t by winning the Calder Memorial Trophy, but needs to put together a strong run down the stretch. Both teams are staring at two critical points on Monday night, and the goalies will be on center stage. Let’s not forget that once upon a time Niemi and Crawford were teammates in Rockford. Not a long shot to guess that only increases their desire to win against each other.